Wood smoke is the problem, no doubt about it, and is by far the most compelling argument against wood heating. To be fair, the critics do have a point, although their extremism can be off-putting. There are places, mainly communities in sheltered mountain valleys, where, when the locals fire up their stoves and fireplaces during a cold snap, the smoke gets so thick you can't see across the street. A frigid, stagnant air mass traps the smoke close to the ground. It smells terrible, affects everybody and makes some people sick. For most of us, though, wood smoke is rarely seen as an issue because the particular topographical and climatological features that trap smoke don't exist everywhere. Wood smoke tends to blow away before it annoys anybody. Smoke pollution only becomes a problem when the odd person can't or won't burn properly, thus attracting the ire of the neighbors. In truth, the majority of woodburning devices currently installed are filthy in the smoke emissions department. That is, they emit particulates at the rate of 20 to 60 grams per hour of operation. A person who sets out to burn without smoke could easily get below this range by using decent fuel and burning smaller, hotter fires. Unfortunately, many people don't know how. And, as of the last twenty years or so, we have new wood heating technologies that emit less than 7.5 grams per hour and most of the current models run in the range of 2 to 4 g/h. Again, an operator with a no-smoke attitude can get to the lower end of this range. 1. Wood vaporizes when heated into gases and tar particles. 2. If the temperature is high enough the tar particles vaporize into chemicals and carbon particles. 3. If the temperature is higher still and there is oxygen present, the gases and particles burn in bright flames.As pollutants go, the story of wood smoke is an interesting one. Chemically speaking, wood is about half carbon and the rest is mostly made up of oxygen and hydrogen. When you heat up a piece of wood, it starts to smoke and turn black at the same time. This is because the other stuff vaporizes under intense heat faster than the carbon burns, so smoking leaves much of the carbon behind until only charcoal, which is just about pure carbon, is left. The smoke that vaporizes out of the wood is a cloud of nasty, gooey little droplets of a tar-like liquid. Chemically, these droplets are actually big, gooey, complicated hydrocarbon molecules that take a number of different forms, mostly bad. If you've followed the issue, you may have seen the list of fifty or so chemicals found in wood smoke. They all sound lethal, but it turns out that only a few are actually carcinogenic. Be aware, however, that the list is bogus because these are the chemicals that result from smoldering, not burning. When you burn wood properly in a bright, hot, turbulent fire, what you see is the tar droplets rising off the wood into a zone of extreme heat where they re-vaporize, cracking into their basic, mostly gaseous, constituents, and oxidize. That is to say, they burn. You are left with carbon dioxide, some carbon monoxide and a number of other gases, water vapor and some not quite completely oxidized hydrocarbon bits. The bits are the particulate emissions that EPA regulates. When it comes to these sooty particulate emissions, of course, the fewer the better. The complicated hydrocarbons that spew into the air as smoke from a smoldering wood fire are inherently unstable. And they stink. Hence their formal name: polycyclic aromatic hydrocarbons. As soon as the tarry droplets exit the chimney their more volatile gases start to evaporate and their chemical make-up changes. In the scheme of things these are heavy molecules so they eventually fall to ground. There, they mix with water and soil, transforming again as they blend into the background as humus. The key point is that while wood smoke is unhealthy to breathe in high concentrations, it is not poisonous to the environment. It turns out that the human nose is almost unbelievably sensitive to these aromatic hydrocarbons. Maybe you have experienced this: you are cross-country skiing or snow shoeing far from the nearest house when out of nowhere comes that wonderfully spicy scent of wood smoke. Your nose can detect the most minute concentrations of these compounds in the air, at lower concentrations than the most sensitive emission montoring equipment. In most people these hints of wood smoke in the air elicit fond memories of hearth and home. Some say our highly developed response to the smell of burning wood is a form of ancient homing instinct that we still carry around in our genes. But, at what airborne concentration does wood smoke change from being a pleasant smell to being unhealthy air pollution? The technical answer is probably meaningless to most people, but they sure know when they've inhaled enough, and it isn't much. Although there might be some debate about acceptable concentrations in the outside environment, the smell of wood smoke inside a house must always be defined as pollution. No woodburning system should ever spill smoke into the room. If yours does, you really ought to get it looked at. These three photos from the Washington State department of ecology show smoke opacity levels. Note that a properly used EPA certified appliance will produce a much clearer exhaust than the photo on the left. 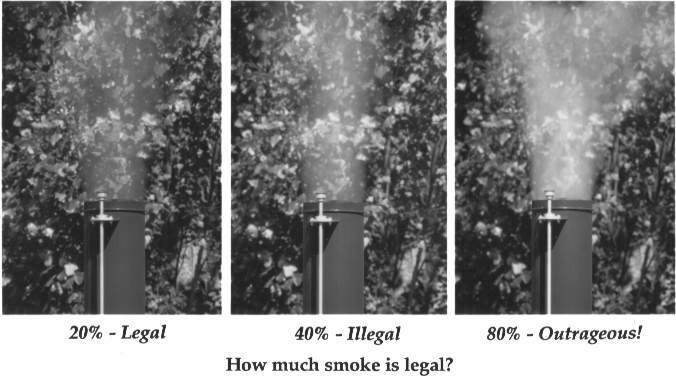 There are many ways to reduce the amount of smoke your woodburning activities produce. In fact, by using all the techniques that follow, you can get your emissions down near the range that oil furnaces produce, and you don't hear too many complaints about oil heating emissions. If you don't already use an EPA certified stove, fireplace or insert, buy one as soon as you can. This one step can cut your emissions by as much as 90 per cent. Pellet stoves and masonry heaters are not usually EPA certified, but burn in the sub-5 gram range, so they are also low-emission options. Use only properly seasoned firewood. That means it is cut, split and stacked in the open between six months and a year before burning. Drying may take longer in cold, damp climates, or if the wood is big pieces of very hard wood. Split the wood to a range of sizes that suit your heater. When wood burns it should be flaming until only charcoal remains. If there are no flames, something is wrong. With seasoned wood, correct air settings and proper loading arrangement you should expect almost instant ignition of a new load of wood. If the wood doesn't ignite quickly, something is wrong. If the appliance has a glass door with airwash, it should be clear. If the appliance has a glass door without airwash, it will be hazy, but should never be totally black. The exhaust coming from the top of the chimney should be perfectly clear or white with steam. A plume of blue or gray smoke indicates that you have a problem. That's all there is to it. Clean burning with no smoke is not rocket science, it just takes some extra awareness like most other acts of environmental responsibility.